Los Angeles, CA (December 1, 2017) – Last night at its 13th Green Gala, the Los Angeles Chapter of the U.S. Green Building Council (USGBC-LA) presented its 7th Annual Sustainable Innovation Awards (SIA) across eleven categories (listed below), with two Projects of the Year awarded: to the first Zero Net Energy multi-family, affordable housing project in Los Angeles, the Silver Star Apartments (New Construction), and to RDC-S111 Urban Office (Existing Building) that adapted an existing building to transform a company’s traditional office model into a WELLness-focused transparent workspace. 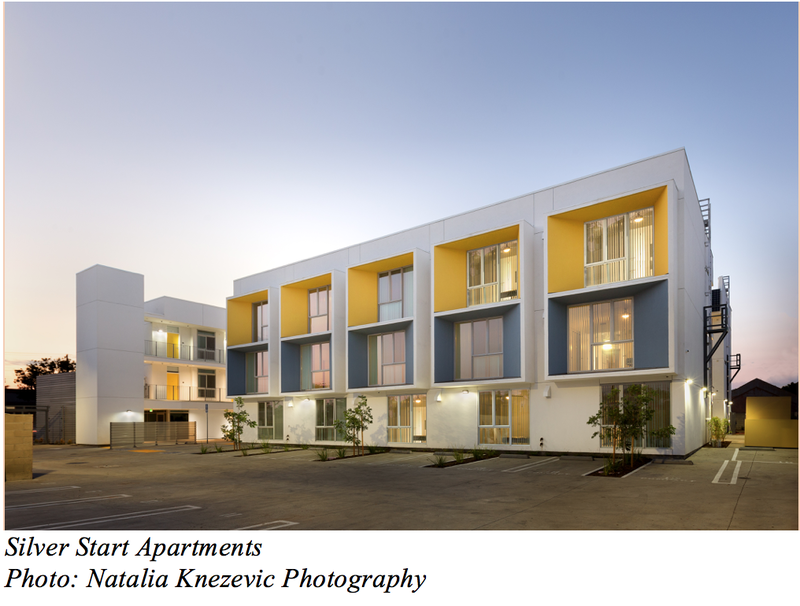 L.A.’s “Oscars” of green building, the awards affirm a project team’s commitment to a sustainable built environment, and reflect the Chapter’s emphasis on energy & water savings, air quality, good design, and community engagement. As of this year, the SIAs are also now open to projects certified under any sustainability rating system. PV system designed to offset 105% of all site energy use and has the resiliency of battery storage if power from the grid is lost. Repurposed a vacant Nordstrom Rack into their workspace, leaving behind a corporatetower, now provides connection to the neighborhood and community. Design features include daylighting, low water consuming fixtures and landscaping, smart material selection, and indoor/outdoor gardens. Multiple exercise and team activity options, along with bikeshare, are part of the expanded wellness program, and participation has increased from 15% to 35%. The WELL certification has also encouraged staff to collaborate on initiatives such as a Monthly Book Club, a Biggest Loser (weight loss) program, a Garden Club, etc. “The Sustainable Innovation Awards recognize projects that go above and beyond credit achievement. 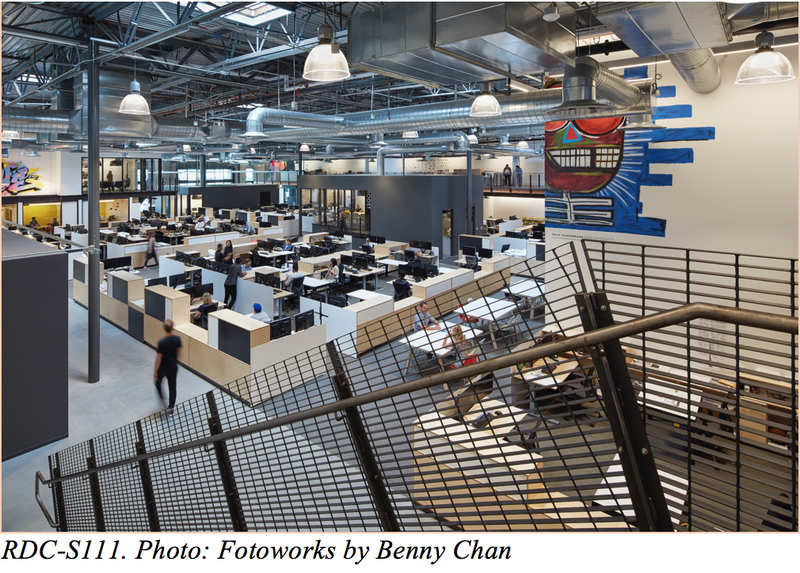 The project teams honored this year employed creative strategies that we hope will inspire the design and construction community to push the limits of standard practice. Thank you to all who submitted projects for consideration,” shares SIA co-chair Patti Harburg-Petrich of BuroHappold. The awards also featured a new category, Social Equity, which was presented to L.A. County’s Rancho Los Amigos National Rehabilitation Center for patients with spinal cord and brain injuries, along with a community wellness center. The Center has served 1000s of the underserved since 1988, and has become a premier stop for such injuries. The project team’s theme, “Architecture that cares” is reflected in the resulting supportive natural and human environments. The design/build highlights include: Replacing underperforming buildings and hardscape to increase the open space to 40%; a perforated metal scrim to protect the southern façade from direct heat gain and provide a protected pathway for users; natural and intuitive wayfinding to reduce stress; color­enhanced lighting in patient rooms and therapy spaces; operable walls open to the outdoors; and public art to serve as a healing mechanism and enhance the communal and familial culture. The project will result in a total of four LEED buildings and a campus that is certified LEED­NC for Healthcare under a LEED Master Site. Additionally, two special awards, selected by the Board of Directors, made their debut: Carlos Herrera, President of Interior Removal Specialists, Inc. was presented with the new Visionary Business Leader of the Year award, recognizing outstanding leadership by an individual who is leveraging his or her influence, power, position, or purchasing power to increase the prevalence of sustainable business practices. 2017 Legacy Project Partner, Community Services Unlimited, Inc., earned the new Partner of the Year award, recognizing outstanding leadership by a partner organization of the USGBC-LA that is leading the way to a more sustainable future through its dedication to serving its community through programs, education, and support for their members and/or employees. The awards honor premier projects—COMPLETE LIST FOLLOWS BELOW—that have already been envisioned, designed and/or built, recognizing exceptional achievement and innovation in each category for Southern California certified projects from the previous year. Also new this year is an expanded invitation to multiple third party verified projects. Past awards were solely open for Leadership in Energy & Environmental Design (LEED) projects, followed by WELL when it came to market. The SIAs also now encourage Envision, EcoDistricts, PEER, SITES, Living Building Challenge, and Passivehouse projects to enter the competition and highlight their innovation approaches. The submissions attract project teams throughout Southern CA’s sustainable community and are awarded regardless of certification achieved. The Awards were presented during the Green Gala at Los Angeles’ the Taglyan Cultural Complex in Hollywood in front of a guest list of over 400 top industry professionals from local government, real estate owners and developers, architects, engineers, contractors, and LEED professionals. USGBC-LA works with anyone who is interested and engaged in collaborative sustainable initiatives. The Green Gala is supported through the donations of these corporate partners: AECOM, Arup, Athens, Bernards Construction, Building Skills Partnership, BuroHappold, Egan Simon, FormLA Landscaping, Gilbane, Hathaway Dinwiddie, Howard Building Corporation, Interior Removal Specialist, Kilroy Realty, Los Angeles Department of Water & Power, Limbach, Lutron, Okapi Architects, Southern Ca Edison, Vons Credit Union, and Yardi. Merit – Expo Light Rail Line Operations and Maintenance Facility. Carlos Herrera President of Interior Removal Specialists, Inc.
HGA Architects and Engineers, Inc., Saiful/Bouquet, Inc., FBA Engineering, Fundament & Associates, Inc., JMC2 Civil Engineering and Surveying, Veneklasen Associates, Katherine Spitz Associates, Inc., Guidepost Solutions, Davies Associates, Inc., Rolf Jensen & Associates, Inc. Copyright © 2019 Green Home Builder. All rights reserved.